The fundamental principle of the Magneto-Caloric Effect (MCE) was discovered by E. Warburg (1881) and further on studied by Debye (1926) and Giauque (1927). The first magnetic cooling system for a very low temperature (0.25 K) was built in 1933, leading to a Nobel Prize in physics in 1949. The magnetocaloric effect (MCE) results in a few Kelvin reversible temperature change within a magnetocaloric material when a magnetic field is applied. The material reaches the initial temperature once the magnetic field is removed. Depends on the magnetic field intensity, on the magnetocaloric alloy and on the temperature. Has a greater intensity at the Curie temperature of the material. Permanent magnet materials will be employed as field source within the ICE project. This is usually done for systems requiring a high cooling power. 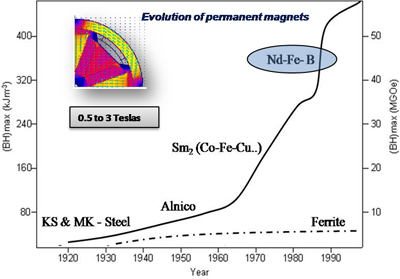 In the end of the 20th century an important progress has been done in NdFeB-based permanent magnets. The whole system has to be designed properly in order to achieve a maximal magnetic induction in the maximum volume of active MCE materials and to permit the alternate and repetitive variation of the magnetic field. With this technology, thermal COPs between 2 and 22 can be achieved, thus higher than in conventional vapour-compression chillers. The machine designed for the ICE project uses an AMR (active magnetic regenerator) which is a regenerator made of magnetocaloric material exposed to a periodic intermittent magnetic field. 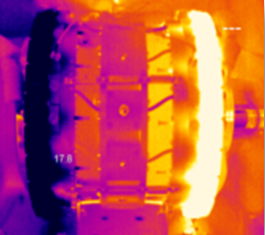 A temperature gradient is created along the regenerator, as shown in the next IR picture of the ICE project magnetocaloric heat pump prototype.